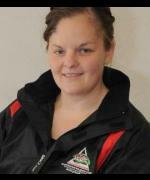 Louise O'Loughlin plays on our Adult Ladies team. In recent years this current group of players have once again rejuvenated the Ladies section of the club bringing success along the way as well. Q5:Best moment playing for Wanderers: Championship QF this year, making SF Which was probably the worst. Q6:Favourite Pitch: Frank Kelly Park, nice and small. Q7:Favourite training drill: shooting drills, don't get much of a chance in the backs. Q11:Laziest team mate in training: eh... Best not offend anyone.